If your into tattoos and want to support a website like this, drop me a dollar or two. .
* Please feel free to send in your tattoo pictures for others to see! *PICTURES THAT ARE SUBMITTED MUST BE YOUR TATTOO OR APPROVED FOR USE BY THE OWNER OF THE TATTOO. THE SUBMISSION OF TATTOOS CONSTITUTES YOUR CERTIFICATION OF AUTHENTICITY AND PERSMISSION TO PUBLISH AND REPUBLISH SAID TATTOOS, WORLDWIDE, WITHOUT RESTRICTION, FOR NO PAYMENT. TATTOOS ON THIS SITE HAVE ALL BEEN SENT IN BY VIEWERS OR TAKEN BY EDDIE HIMSELF. 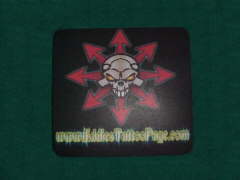 There is only a few left and the price has been lowered to get rid of them so anyone interested in www.EddiesTattooPage.com mousepads can now purchase them online! The price is $6 each and shipping/handling is included. While supplies last free EddiesTattooPage.com stickers will be included. See picture below.